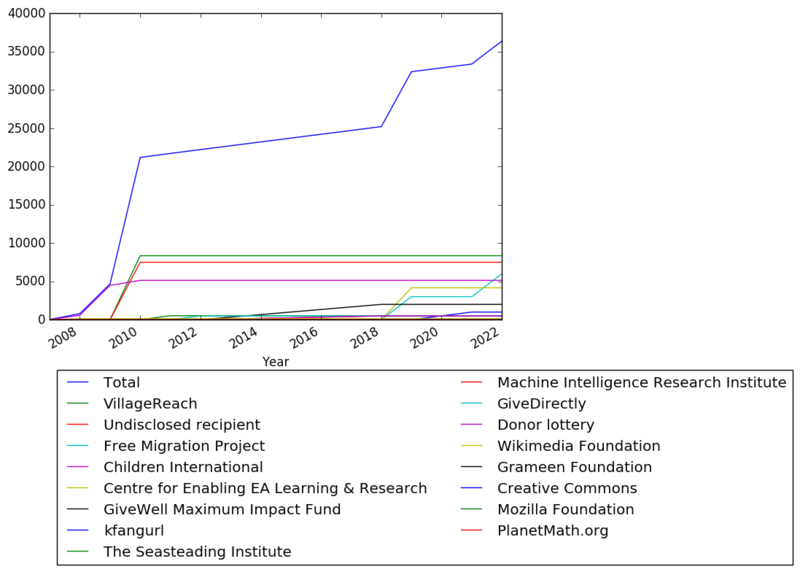 Should you donate to the Wikimedia Foundation? 2015-03-28 Vipul Naik Effective Altruism Forum Wikimedia Foundation Evaluator review of donee Knowledge commons The post says: "I believe that some of the common arguments people make in favor of the donating to the Wikimedia Foundation (WMF), the non-profit that hosts Wikipedia and a number of its sister sites, are flawed." EA Hotel 4,167.10 3 2019-03-31 Effective altruism/housing https://forum.effectivealtruism.org/posts/BM2DYWpM6rSxyZ7AS/my-q1-2019-ea-hotel-donation -- Reasoning for donation explained in detail in the blog post. Essentially, the donor liked the idea, skin-in-the-game of key players, execution, and marginal impact, and was not dissuaded by the lack of other funding. The amount listed as donated is based on Fixer.io currency conversion; the actual amount paid out by the donor was $4306.41 USD, including a foreign exchange fee. 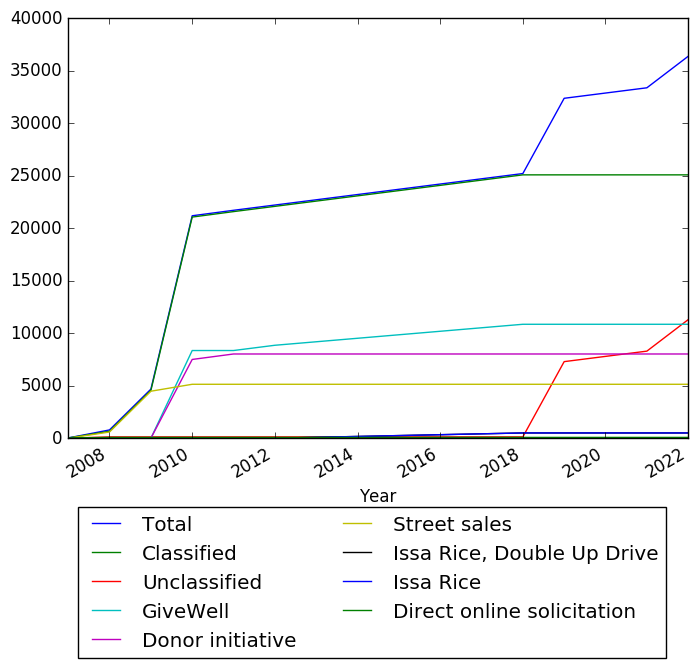 Percentage of total donor spend in the corresponding batch of donations: 100.00%. 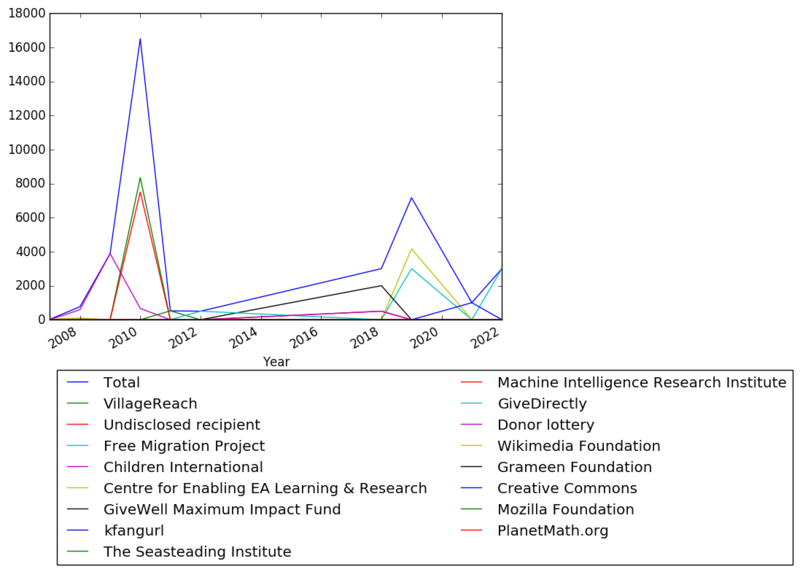 GiveWell top charities 2,000.00 4 2018-12-22 Global health and development https://forum.effectivealtruism.org/posts/dznyZNkAQMNq6HtXf/my-2018-donations GiveWell In the explanatory blog post, the author says: "For the money directly allocated by me, GiveWell top charities won as a default baseline because the alternatives were not yet compelling enough.". Employer match: LiftIgniter matched 100.00; Percentage of total donor spend in the corresponding batch of donations: 100.00%. Donor lottery 500.00 9 2018-12-22 -- https://forum.effectivealtruism.org/posts/dznyZNkAQMNq6HtXf/my-2018-donations Issa Rice Donation decided on by Issa Rice. 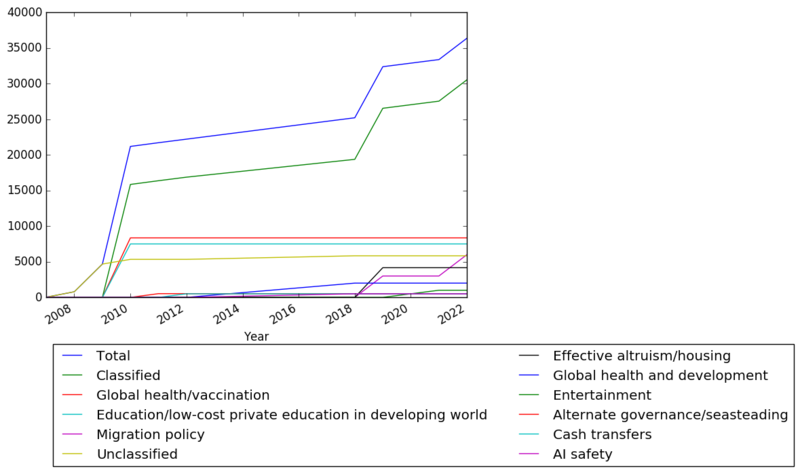 The lottery in question is a $500,000 donor lottery for the end of 2018, as described at https://app.effectivealtruism.org/lotteries/63715163508813 The blog post explaining the donation says: "For each of the years 2017 and 2018, I had given Issa the option of assigning $500 of my money to charitable causes of his choosing (with no strict requirement that these be recognized as charities). In 2017, Issa deferred the use of the money, so he had $1,000 to allocate. Issa ultimately decided to allocate 50% of the $1,000 (i.e., $500) to the $500,000 EA Donor Lottery, and another 50% to the Machine Intelligence Research Institute (MIRI). For the donor lottery, the understanding was that although the entry was under my name, Issa would make the decision as to how to allocate the winnings in the (0.1% probability) event that I win the lottery.". Percentage of total donor spend in the corresponding batch of donations: 50.00%. Machine Intelligence Research Institute 500.00 9 2018-12-22 AI safety https://forum.effectivealtruism.org/posts/dznyZNkAQMNq6HtXf/my-2018-donations Issa Rice Donation decided on by Issa Rice. The blog post explaining the donation says: "For each of the years 2017 and 2018, I had given Issa the option of assigning $500 of my money to charitable causes of his choosing (with no strict requirement that these be recognized as charities). In 2017, Issa deferred the use of the money, so he had $1,000 to allocate. Issa ultimately decided to allocate 50% of the $1,000 (i.e., $500) to the $500,000 EA Donor Lottery, and another 50% to the Machine Intelligence Research Institute (MIRI).". Percentage of total donor spend in the corresponding batch of donations: 50.00%. 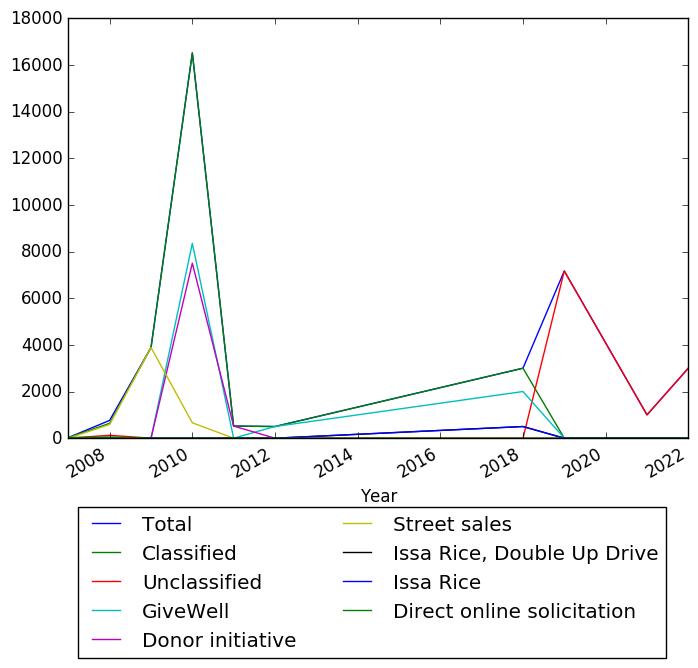 Children International -- -- 2009 -- https://vipulnaik.com/donation-history/ Street sales Percentage of total donor spend in the corresponding batch of donations: 100.00%.